He was the best tennis player not enough people saw. Sixty years ago, Pancho Gonzalez, with a serve as fiery as his temperament, won his second consecutive United States Championships title at Forest Hills. Forty years ago, at 41, he survived a 5-hour-and-12-minute, 112-game, five-set duel at the second Wimbledon of the Open era. It prompted the tie-breaker format. In between, he disappeared into what then was the almost invisible world of professional tennis. He is often forgotten now, but had the lofty lords of tennis opened the best tournaments to pros long before 1968, Richard Alonzo Gonzalez would be in the conversation with Roger Federer, Rod Laver, Don Budge, Bill Tilden and several others when the best players are discussed. And for what he meant to the game, he will be honored Saturday evening at the United States Open, 14 years after his death from cancer. Swarthy and scarred when the door handle of an automobile gashed his left cheek as he rode his homemade scooter, the oldest of seven children born to working-class Mexican immigrants in Los Angeles, Gonzalez was American tennis’s first minority champion. Less than a decade after his wins at Forest Hills, Althea Gibson won at Wimbledon and Forest Hills; nearly two decades later, Arthur Ashe won the first United States championships of the Open era. Gonzalez taught himself to play on the Exposition Park cement courts near the Los Angeles Coliseum with a 51-cent department-store racket, a gift from his mother on his 12th birthday. For all of Gonzalez’s talent at 15, the squire of California tennis, Perry T. Jones, barred him from a trip to the fashionable Eastern junior tournaments for scholastic reasons. But a year later, Jones accepted him, and after a hitch in the Navy, at age 20 Gonzalez won the 1948 United States singles title as the No. 8 seed. When he lost to Budge Patty in the French championships and to Australia’s Geoff Brown in the third round at Wimbledon, he was branded a “cheese champion” by the tennis writer James A. Burchard of The New York World-Telegram. That inspired a comparison to the Italian cheese gorgonzola, and the Gorgo nickname that would accompany him throughout his career. But after he won the 1949 United States title in a five-set final with Ted Schroeder, he signed a $75,000 contract with the promoter Bobby Riggs to challenge Jack Kramer on the mano-a-mano pro tour. Kramer won, 96 matches to 27, dropping Gonzalez into oblivion in 1950. After struggling in round-robin matches in the early 1950s with Frank Sedgman and Pancho Segura, Gonzalez routed Tony Trabert, 74-27, in their 1956 tour, then conquered Ken Rosewall in 1957; and Lew Hoad in 1958 before retiring to a lavish club job in the Bahamas. But with pro tennis at a standstill, he returned in 1964, sweeping Mal Anderson, Laver, Hoad and Rosewall in a $15,000 tournament at the Westchester County Center in White Plains. In 1966, Kramer acknowledged that Gonzalez was the pro tour’s most important player. Hero to the few fans who attended the pro matches, villain to his rivals. He had feuded with Kramer for paying him less than the players he was beating. Rather than traveling with the other pros, he was a lone wolf, often driving through the night to the next city in his Thunderbird with its 350-horsepower Cadillac engine. “That’s the way I wanted it,” he once said. 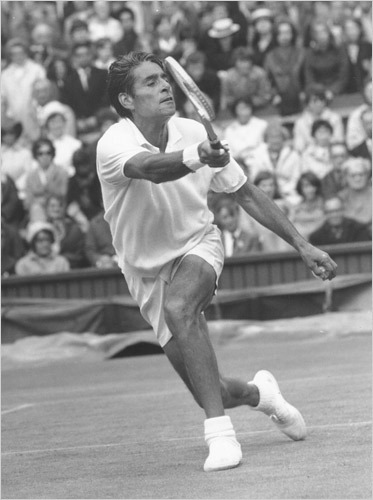 When the Open era arrived in 1968 and allowed pros to compete for prize money in what traditionally had been amateur tournaments, Gonzalez was 40. At Wimbledon that year, he lost to Russia’s Alexander Metreveli in the third round. At the Open, he knocked off Australia’s Tony Roche but lost to Tom Okker, who lost to Ashe in the final. At 41, in the first round of the 1969 Wimbledon, he lost the first two sets to 25-year-old Charlie Pasarell, by 24-22 and 6-1, before darkness halted play. The next day, he swept three sets, 16-14, 6-3, 11-9, for a victory that summed up his career: struggle, fury, comeback and eventual appreciation. He soon retreated to being the teaching pro at Caesars Palace in Las Vegas, where he met Andre Agassi’s sister Rita, his sixth wife and the mother of his eighth child, Skylar. Early in 1995, he had chemotherapy and radiation for a tumor where his esophagus joined his stomach. Four months later, he died. But on Saturday night at the Open, if you close your eyes, you will see him flicking perspiration off his forehead with his left forefinger as he crouches to return serve. The best tennis player not enough people saw.